Integration with G Suite is built into Smartsheet. Smartsheet and G Suite complement each other at every turn. Seamless integration with Google Docs, Gmail and Calendar and hassle-free single sign-on will help you and your team become instantly productive. Seamless - Sign in to Smartsheet with your G Suite account info and start instantly collaborating on tasks, files and comments. 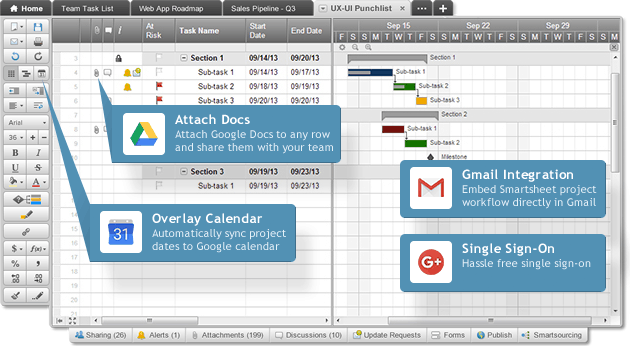 Smartsheet will be added to your App Launcher for easy navigation. Work In Context - Get more done with a familiar-looking spreadsheet interface that keeps everything in context. Attach files and Google Docs to any task. Connected - Manage project information your way. Import Google Contacts to efficiently collaborate with teams, update Smartsheet project information directly from within Gmail, and sync your project calendar to your Google Calendar. After installation, Smartsheet will become available from the App Launcher menu and domain users will be able to access Smartsheet from within G Suite. Contact a Smartsheet representative to learn more about using Smartsheet with G Suite.